I think someone is using a can opener back there. The Book of Night with Moon by Diane Duane was one of my first books (if not the first). When I was young I was way into cats, and here was a book about cats! It was published in 1997, so it predates Erin Hunter's Warrior Cats series by 12 years. ﻿﻿﻿﻿﻿﻿﻿﻿It was about a group of cats who's job was to maintain portals between worlds in New York. They also had their own language, which I loved. It's been a long time since I've read the book, but I still remember some pretty cool parts, like at one point a T-Rex somehow ends up tromping around the city, and eats an opera singer. The cats have to patch correct pieces of timeline (like minus the T-Rex) to fix the problem. It's actually pretty unique, and a pretty treasured book on my shelf. Lookin' weirdly proportioned there kitty. 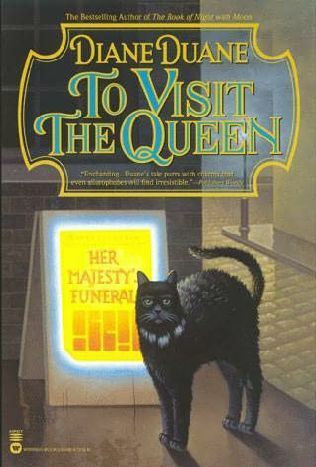 It is most definitely standalone, but a sequel was made, called To Visit the Queen (On Her Majesty's Wizardly Service, in the UK). I didn't know there was a sequel for an incredibly long time, and only found it by chance at a library when I was looking for Duane's Young Wizards series (which The Book of Night with Moon is a spin-off of). To Visit the Queen is seen as a Steampunk book because, through time-travel, Victorian Britain is given access to high-technology. I spent years looking for the sequel, and only a year or two ago managed to find one. Probably one of the best things about the series is that it doesn't totally hang on the fact that the main characters are cats. You could probably replace the cats with humans and have an equally good story, but the cat element is what makes it unique.